The Southeastern Raptor Center at Auburn University is well known for its educational and wildlife conservation programs and for its work rehabilitating and releasing raptors back into the wild. With the acquisition of a new 2017 van, the center now is positioned to broaden its outreach. 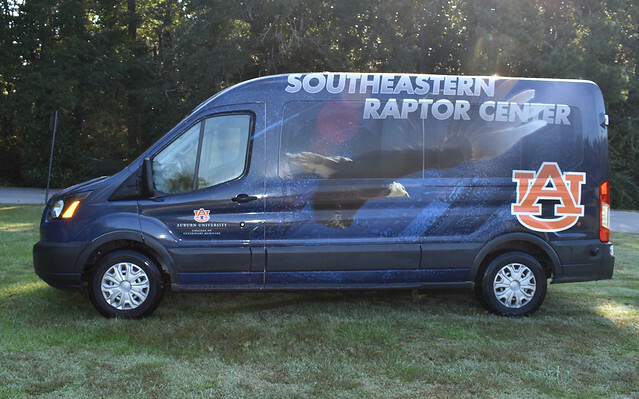 Through the generosity of private donors, the raptor center, a division of the College of Veterinary Medicine, replaced its old van this year with a new Ford Transit, complete with custom graphics and custom travel racks designed to hold avian cages. 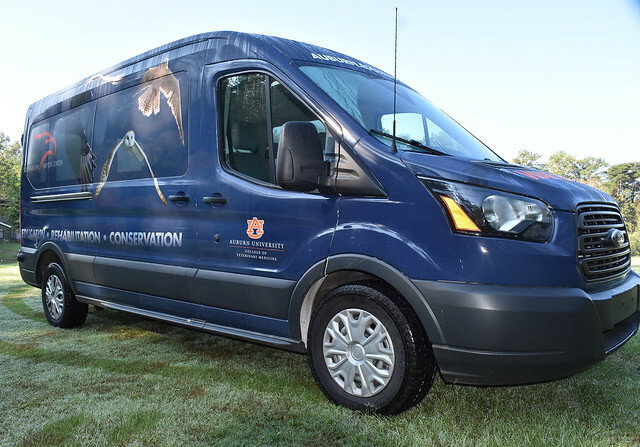 Funds for the van were primarily provided through a gift from former Auburn football player Mac Crawford of Tennessee, and his wife, Linda. Both 1971 graduates of Auburn, Mac earned a degree in business administration, and Linda a degree in home economics. Crawford and his wife have long been supporters of Auburn University. 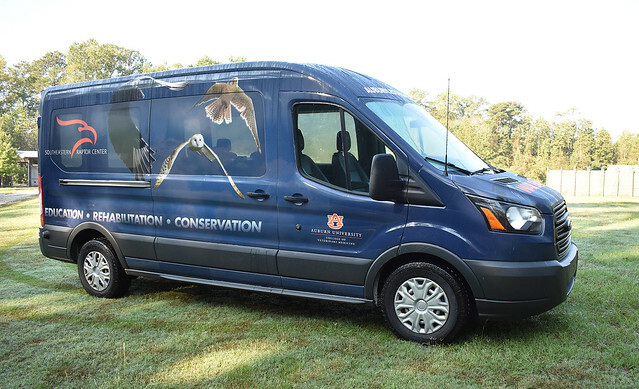 "We think a lot of Auburn’s Veterinary Medicine program, and we are particularly interested in the raptor program and the excitement it brings to Auburn football and the educational value that it provides,” he said. The new van will serve as a multipurpose vehicle, according to Raptor Specialist Rhett LaPorte. "We will continue to use the old van, but the new van will become our go-to vehicle for longer road trips,” LaPorte said. Center staff make about 300 educational program trips annually throughout the state and Southeast, mostly to schools and civic organizations who are interested in raptors and conservation. "We typically take along up to seven birds,” LaPorte said. An educational program typically includes owls, falcons and, of course, Spirit—one of the eagles that free-fly at the opening of Auburn home football games. In addition to the seven-bird travel entourage, the new van also can transport up to seven human passengers. Groups interested in scheduling an educational program can do so online by completing an online "request a program” form at or by calling (334) 844-6943. 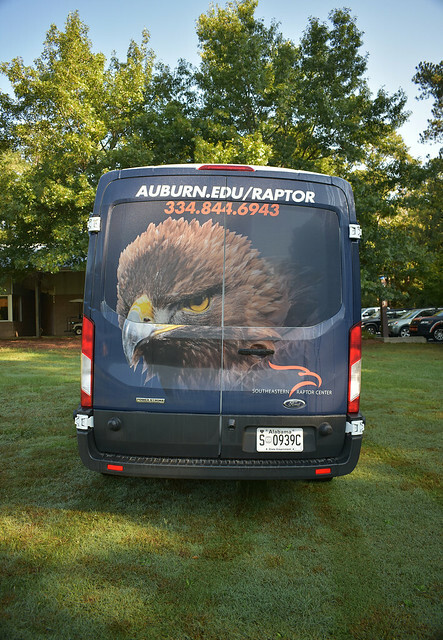 The Southeastern Raptor Center, a division of Auburn University’s College of Veterinary Medicine, has a new van with custom graphics and custom travel racks designed to hold avian cages.